Few women would argue that being ‘slim’ isn’t actually what they want. Society conditions us to believe that being slim is what we need to be in order to be happy, successful, healthy and loveable. 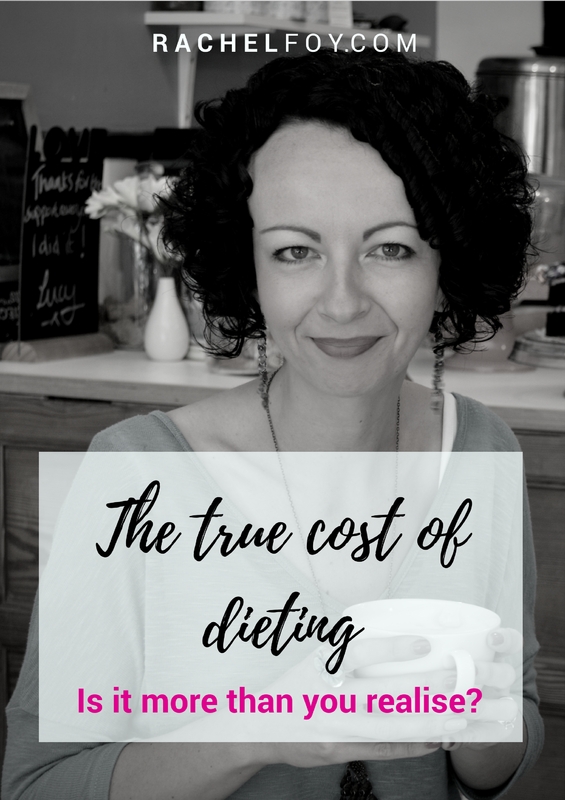 Yet have you ever really sat back and thought about the true cost of dieting? Many of us are desperate to feel more confident and happy in our skin. We want to be able to smile when we see ourselves in the mirror instead of automatically criticising every lump, bump and wobbly bit which is reflected back to us. Many of us truly believe that this is what going on a diet will help us with. We’ll find our confidence. We’ll learn to love ourselves and our bodies. We’ll finally learn to be happy. I’m not just talking about financial cost, although for many of us who have made dieting our ‘profession,’ it’s substantial money. Gym memberships, diet clubs, diet food, weight loss pills, potions and gadgets….it quickly adds up over the years. The dieting industry isn’t a multi billion dollar industry for no reason and with the average female going on a diet 4 times a year(!) you can see why! So what is the true cost of dieting other than financial? I bet you’ve never even thought of this have you? I’m talking about the emotional cost. The psychological cost. The spiritual cost. Dieting has become so socially accepted nowadays and sadly ADMIRED, particularly amongst women (it’s just what we do! ), that many of us don’t even question at what cost our food restrictions, eating rules and exercise regimes are actually having on us. I never questioned any of this when I was a diet junkie. I single handedly kept the diet industry going at one point in time, literally spending a small fortune in the quest to be slimmer. To find the solution to me feeling miserable about myself. To find the answer to feeling more confident. To find the magic door to happy land. I once invested £1200 in an oxygen detox program!! £1200??!! I sat in an oxygen tank whilst my body “allowed the oxygen to break down fat cells” ( what?!?!) and then for 40 minutes afterwards I was wrapped in plastic, much like a shrink-wrapped chicken whilst forcing my poor body to do lots of crazy stretching exercises in a ridiculously hot room in order to “release those fat causing toxins”! I kid you not. They must have seen me coming, along with the 20+ other women who were there at the same time, all looking how I felt. The cost of that 8 weeks was far more than I realised…. I remembered feeling so humiliated at being wrapped in plastic whilst some strict and condescending women inspected my body in great detail with absolutely no respect whilst telling me I really should stop eating carbs as that’s why my thighs were fat! I remember feeling worthless as I turned my body inside out trying to flush the toxins from her, wondering why the hell I was doing this, but then remembering it was because I needed to lose weight. That was the reason….right? I remember feeling terrible lying to work colleagues as to why I couldn’t go for a drink after work as the reality was, I was too embarrassed to tell them what I was really doing in an oxygen tank! The greatest cost, however, was the emotional disappointment and the amount of increased hatred I had towards myself, when after 8 weeks, the final measurements revealed NOTHING HAD CHANGED. The stern and down right nasty women told me I must have been cheating on the diet plan as there was no way that I couldn’t have lost anything. Yet my body had stayed the same. Not surprisingly, the cost of that experience was not just £1200 (which in itself makes me cringe to think I was so desperate). It was also the trigger for one of the biggest and self destructive binges I ever had. I even remember being sick on a few occasions as I was so disgusted with myself for having eaten 4 chocolate muffins in one go right after an entire box of cereal……..I was in physical pain. My poor stomach couldn’t take it anymore. The emotional pain I had due to my search of slimness also reached it’s limit. A few months later I had reached the peak of my dysfunctional relationship with food and my body and I remember sat on the floor of my apartment, having inhaled an entire box of chocolate coated breakfast cereal crying my eyes out, just wishing it would all stop. The obsession, the calorie counting, the fear, the panic, the anxiety, the restriction, the guilt, the body hatred. All of it! The cost of dieting for 12+ years had taken over my life in every single area. I couldn’t physically, emotionally, mentally and spiritually take it anymore. Dieting had cost me friends, it had cost me valuable and irreplaceable life experiences, I often found myself turning down spontaneous nights out as I was ‘trying to be good’ and it had cost me a healthy relationship with my then boyfriend as I was too self conscious of how my body looked. It had cost me the pleasure of living! I thankfully found a way out of that crazy cycle with the right help, the right mentors, the right support and the right friends. If my story sounds familiar, I honestly just want to give you a huge hug right now and tell you…..You aren’t alone. What I now know to be true is to feel confident in your body and happy in your life, it’s not about focusing on the food and dieting, it’s about focusing on living your life to the full………. something which diets are very good at taking away from you. If you are a chronic dieter, like I used to me, I sincerely ask you to stop and think about what the true cost is of this behaviour? The cost to you? The cost to your life? What is your body and your soul really hungry for? Because perhaps, just maybe, the cost of continuing on this slippery dieting path, will be far more than you ever intended it to be when you started. Want some extra help with ditching diet mentality? I’ve created a free food freedom guide just for you, which contains a comprehensive approach on how to heal your relationship with food and yourself. It also includes a free meditation to help you start listening to your body MORE and the diet gremlin LESS.